In Missinipe, 80 km N of La Ronge on Hwy 102. Airstrip within 3 km. Open May 15 to Sep 30. ​This unique adventure explores mysterious sand dunes located in the northwest corner of Saskatchewan along the south shore of giant Lake Athabasca. 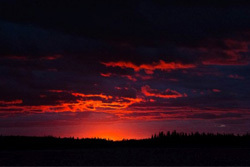 From Saskatoon to Uranium City and then by motor boat to the shores of Lake Athabasca at Williams River is a week-long walking journey into some of the most unique scenery that northern Saskatchewan has to offer. Photographers come here from around the world. Protected as a provincial wilderness park, the Athabasca Sand Dunes are the most northerly dunes in the world. 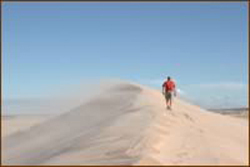 Stand on top of the biggest sand dunes where rare plants grow. ​Starting and ending in Missinipe, this beautiful canoe route along the Churchill River will guide you through the famous French-Ducker loop and past the rock art in Rattler Creek. A campsite between the mighty upper and lower North Falls on the Churchill River completes this wilderness canoeing adventure. Typical Precambrian Shield type terrain, granite rock art, island filled lakes and majestic waterfalls make camping on rocky ledges by the water's edge adventurous. Bald eagles might circle overhead looking for a meal of fish. You will experience the power of the Churchill River at Twin Falls and Robertson Falls. You can imagine events of the past when you look at the ancient rock paintings in Rattler Bay. There are numerous points of interest along this route. 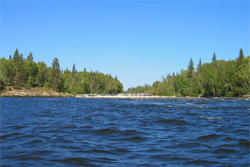 ​The Paull River starts about 75 kilometres north from Missinipe. 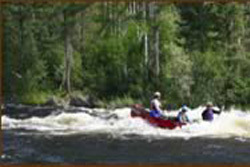 The river follows a southerly course over numerous rapids and a picturesque waterfall and then dumps into the Churchill River. 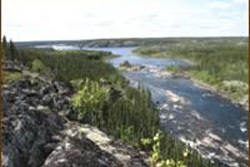 The canoe trip then follows the Churchill River to Missinipe where this trip ends. The Paull and Churchill Rivers are unique series of lakes joined by rapids or falls. Flowing over the Precambrian Shield, they pass through a forested landscape of rock outcroppings and muskeg. You may see bald eagles and white pelicans fishing below rapids, moose wading in the shallows, black bears wandering along the shore and enjoy evening concerts by common loon at sunset. As you trace the path of the Vouageurs east, your guide will tell the stories of adventurous times. Rapids are short and both novice and seasoned canoeists enjoy travel on the river because the more difficult rapids can be easily portaged by those without the skills to run them. Accommodation, meals and all canoeing and camping equipment is included. Check website for rate details. Bedding not supplied in hostel. E-transfers accepted as payment.